Who doesn’t love popsicles? Especially during summer weekends. Luckily enough, they are easy to make from scratch and turn into a healthy snack for the whole family to enjoy. I have for you a healthy protein rich version of these yummy treats. They are so good, you might want to make a double batch! Made with collagen peptides, fruits, and coconut milk, these popsicles are loaded with nutrients, antioxidants, and collagen for gorgeous skin and hair! What I love about this recipe, is that it is easy to adjust and make substitutions. Remember the books “choose your own adventure”? Well, it’s kind of like that, except recipe style. You can choose whichever berry (or fruit!) you prefer, or use more than one type of berry. Your choice to add sweetener or leave it out, depending on how much tartness you like. Chia seeds are a great addition for an added fibre boost, but not everyone likes these guys. I chose raspberries for my recipe partly because that is all I had on hand, partly because I wanted my popsicles to be red and white for Canada Day long weekend (because everything is red and white lately, why not make sure my popsicles match all the festive decorations?). Preheat oven to 325 degrees F, and place the berries in a glass dish. Drizzle sweetener (optional), and roast for 15-20 minutes, mashing the berries halfway through. In the meantime, mix the coconut milk and vanilla extract in a small bowl. Slowly whisk in the collagen powder and chia seeds (chia seeds optional), making sure no clumps are formed. Remove the berries from the oven and transfer to a blender, and blend until smooth. 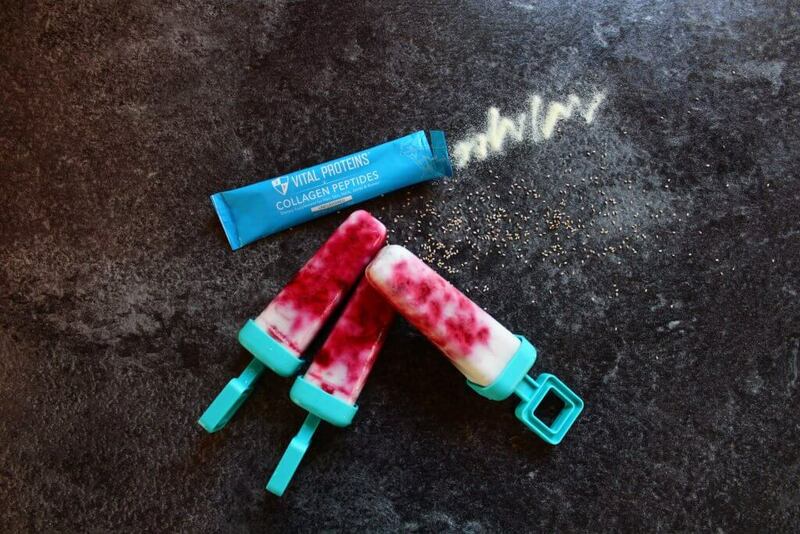 Pour 1 Tbsp of coconut milk in each popsicle mold and add in 1 tbsp of the berry mixture. Continue to switch between the berry puree and the coconut milk until popsicle molds are filled. With a popsicle stick, swirl the berries and milk together to create a marbled effect. Freeze until solid for 4-5 hours, and enjoy during a nice warm day! * Yields approximately 8 popsicles, depending on mold size.